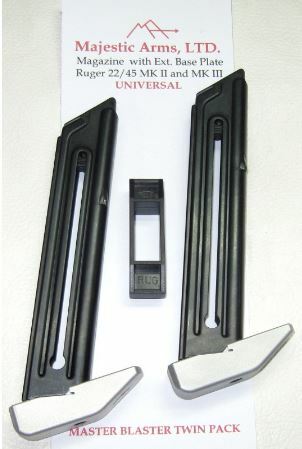 These magazines have been specially engineered to fit either MK II or MK III 22/45 pistols Universally. No need to have separate magazines for MK II and MK III 22/45's. These mags fit and function in both, including the Volquartsen 1911 Style Target Frame. Available singly or in a cost-saving twin pack. Includes a free loading tool.